Well, this year's Ryder Cup had everything, except interesting Rules issues for me to comment on! What a match! The US exceeded everyone's forecast by dominating the four-balls and foursomes and then capitulated. You could make a case for many 'pivotal' moments, but for me Justin Rose's long. looping putt on the 17th, after Phil Mickelson had put an 'impossible' chip to within a few inches of the hole for par was the first time that I believed that the US could be beaten. Congratulations to Europe - a great team performance. • otherwise assist the player in making a stroke or in his play. Q. May one tee be inserted into another tee to make a single, longer tee? A. Yes, providing the total length of the connected tees does not exceed 4 inches (101.6 mm). Q. May a player use a beer can or bottle top as a tee? A. No the tee must be designed to raise a golf ball off the ground. Q. May a player gouge up a bit of turf with their club to tee their ball on? A. Yes, in fact, the English pro golfer, Laura Davies, regularly uses this method to tee her ball. Q. May a player use a broken tee that they find on the teeing ground, or borrow one from another player? A. Yes a player may borrow equipment other than a club from another player. Q. May a player use a tee that is attached to a pitch repairer to ensure that they do not lose it? A. No, the R&A has recently clarified that this is not a traditionally accepted use for a pitch repairer and it would therefore incur a breach of Rule 14-3. Q. 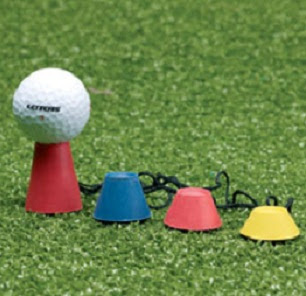 May a player use a tee that is connected to other size tees by a string (as in the photo above)? A. Yes, providing the player does not use the string to indicate the line of play, which would be a breach of Rule 8-2a. “In many countries, but particularly in the UK, the use of two or more tees tied together with string has been fairly common for many years – especially in the winter when the ground can be hard due to frost, or when winter mats are in use. Note that this statement specifically excludes the USA and Mexico. It is my understanding that the USGA has indicated that in their view tees with an attachment that could indicate the line of play may be non-conforming. However, as there is still no official Decision banning them, I think that it would be difficult for any Club or Society Committee to rule that they are non-conforming and impose the disqualification penalty. That does not mean that you are likely to see them used by tour players any time soon! In my opinion, if a player regularly uses such a tee, with neither the string nor the other tees pointing to their line of play or their desired path of swing, I do not think that they should be penalised if occasionally the string or tees may coincidentally point in either of these directions. In stroke play the penalty for someone who does deliberately line up their ball using this method would be two strokes for a breach of Rule 8-2, not disqualification. My suggestion is that if you see a fellow competitor purposely align the string of their connected tees to their desired line of play you should advise them that they will incur a penalty of two strokes if they make their stroke without moving the string to another position. It is always better to stop a player from breaching a Rule and you certainly should not ignore any breach in stroke play competitions. Just a quick question regarding rule 8-2a. A player carries 2 clubs and walks towards his ball. He chooses the club to make a stroke and places another club on the ground and plays his shot. His opponent claims that placing a club on the ground near the ball is a breach of 8-2a. The club lying on the ground was in fact coincidentally pointing the line of play but the player didn't notice until the opponent's claim. What is the ruling? Does breach of 8-2a only occur when it's done on purpose? No penalty was incurred in the circumstance that you describe. There are several Decisions showing that penalties do not apply if the player inadvertently does something that might be construed to be a breach in different circumstances, e.g. walking on a line of putt, standing astride a putt to avoid someone else's line, standing behind a partner as they make a stroke. Yes, as in the blog content above, providing the 'top hat' tee was designed to raise the ball off the ground and was not designed or manufactured in such a way that it could indicate line of play, it is OK to use in competition. It sounds to me that it is not too disimilar to the tees in the photo. I there a rule concerning using an artificial teeing area (mat) as commonly used during winter months at some golf courses. These mats normally have slits to place a tee in but could also be construed as giving a line for the shot. When Committees want players to use mats on teeing grounds they should introduce a temporary Local Rule making their use mandatory. There is no problem with the mats having slits that may be aligned to the hole, it is similar to have immaculately mown tee boxes where lines are visible and may be in the direction of the fairway. Recently received SCGA Fore mag Fall 2017 page 45 and their rules page shared incident where they said they called USGA re: tee tied to another tee. They said USGA deemed it non conforming but didnt explain why. No wonder people hate the rules of golf! I think that you mean, No wonders SOME people hate the Rules of Golf! This is a fairly common question and, if considered in the light of the above comments, then you might reasonably assume that such a configuration would be considered non-conforming – as the string could effectively be used to aid alignment. However, this is one of the Rules with an Exception. In many countries, but particularly in the UK, the use of two or more tees tied together with string has been fairly common for many years – especially in the winter when the ground can be hard due to frost, or when winter mats are in use. Therefore, within The R&A’s area of jurisdiction (i.e. everywhere except the USA and Mexico) the use of a conforming tee which is connected to one or more other conforming tees by a length of cord or string is permissible – provided the cord or string and other tees are not used to aid the player in his alignment. Such a practice would render the player in breach of Rule 8-2a (Indicating Line of Play). I am disappointed to hear that the USGA have not bothered to explain why they are not respecting this common practice in the rest of the world. With regards to tees tied together, if more than one were pushed into the ground would that not be illegal as they are "anchored"
I have never heard of anyone using this practice, but in my opinion it would not incur a penalty. There is no mention of 'anchored' in the description of conforming tees in Appendix IV, l.